Climate controlled garage parking is available for each of the 808 on 5th buildings. With most apartments, your car is exposed to the elements year round which means waking up early in the Iowa winter to clear your car if it snows. We said no more and added secure, climate controlled, underground garage parking to every building. Garage doors and security cameras keep your vehicles and bicycles safe. Additional outdoor parking is available for free for you and your guests with easy building access and plenty of room. With plenty of parking available you will never struggle to find a parking space. When guests visit, they won't have to worry about what day of the month it is, being ticketed or towed, or have to scramble to find coins for a meter. We've got it covered! When we began construction on the 808 on 5th neighborhood we worked closely with the City of Coralville to rejuvenate 5th Street. One of the major improvements for 5th Street residents was rerouting the 10th Street bus route. Now the Coralville Bus System stops in front of our 708 building, providing service every 30 minutes throughout the day with an average delivery to your destination in 9 minutes. Coralville bus stop 4360 is located in front of the 708 building and stop 4361 is located across the street. Public transit enables you to save on gas and maintenance on your investment and provides access to the University of Iowa and Inter-modal Transit Facility located at the Iowa River Landing. University students and employees can get discounted fares with a U-Pass. Do you prefer to commute or just like to get outside for a ride or a run? Then you will enjoy direct access to the extensive and ever growing Coralville and Iowa City trail network. 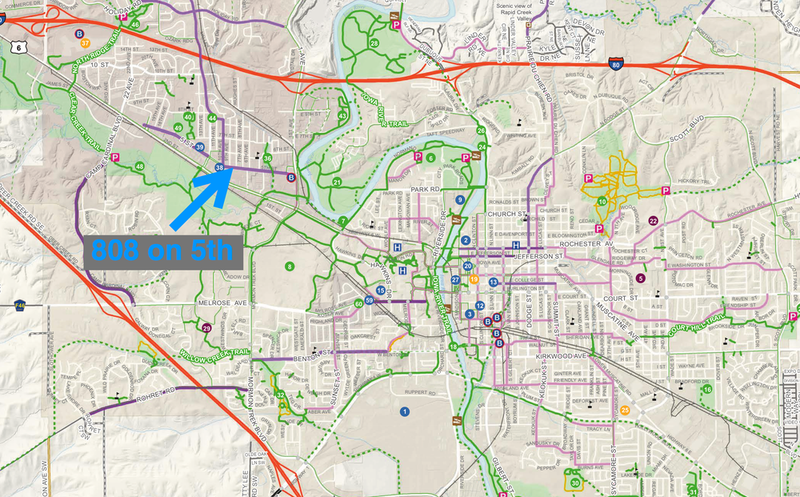 These trails provide a great alternative to driving and weave throughout the Coralville and Iowa City area so you can get where you are going by bicycle or foot. See the map below for even more detail. To accommodate cyclists, we have built in bike racks around our buildings and bike storage in climate controlled, secure garages.